Nathaniel Bacon was on born July 14, 1802, in Ballston Spa, New York, to a farm family of English descent who had settled in the beautiful eastern New York location after the Revolutionary War. Bacon received private tutoring and academy education in his early years, and in 1824 graduated from Union College in Schenectady, New York. After graduation, he studied law and was admitted to the Bar in 1827. In the same year he married Jane S. Sweetman, of Salem, New York. The next year he opened a law office in Rochester, New York. He practiced there for several years. In the years before Bacon was appointed to the Circuit Court and thus to the Michigan Supreme Court Bench, he held several local offices, including those of Prosecuting Attorney and Judge of Probate. 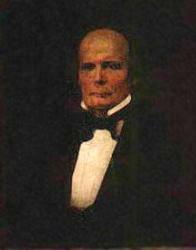 In 1855, upon the death of Judge Whipple of the Second Judicial Circuit, Nathaniel Bacon was appointed to serve out the term. He acted as a Michigan Supreme Court Justice until 1858 when the Court was reorganized. After his service to the state, Bacon continued in the post of Circuit Judge until his death.